Nearly all forms of aikido are predicated on avoiding any possibility of pressure-testing their skills against resisting opponents in free-sparring or competitive environments. Nearly all practitioners stick to demonstration and practice with cooperative partners. 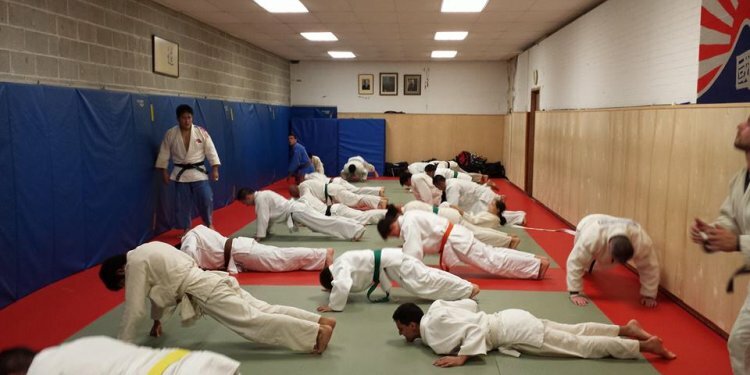 From this it naturally follows that few aikidoka will be caught on camera trying to apply their skills against anyone, let alone someone training in uncooperative grappling, for instance a judoka. Top-level aikidoka in particular seem entirely content with practicing their techniques on unresisting high-level students who can be trusted to know the proper responses, as one would trust a stunt double to flop to the ground dramatically when the sound effects of a sci-fi laser are made. One trusts those students will not resist to even the slightest degree. There are well-corroborated accounts (e.g. in the book Angry White Pyjamas) of elite aikidoka purposefully injuring their students when they didn't sufficiently telegraph their attacks for a demonstration. I would expect most judo-versus-aikido match-ups to go like this video: the aikidoka trying in vain to apply jointlocks against someone grabbing their gi, the judoka applying their arsenal against someone with no footwork, no gripping strategy for an uncooperative opponent, no throwing ability, and no sense of hip power. This of course would go differently if the aikidoka already had a solid base of judo (or wrestling, or sumo, et cetera) skill to fall back on. This, of course, was the original pipeline for aikido pedagogy: students were already skilled at judo, sumo, or karate, and only then attempted to learn secondary, low-percentage skills like standing armbars or tricking an opponent into throwing themselves. This is all in addition to the plain facts of modern aikido pedagogy versus the modern judo pipeline. What do each produce, viewed broadly? How does training change the thousands of people who come through each style's dojo? It's fairly reliable that if you examine someone who has done a fair amount of judo, they received from it the ability to safely take a fall, maintain their balance against an opponent, escape bad positions on the ground, and maybe even execute a few foot-sweeps, throws, pins, and chokes. They're probably stronger, more fit, and mentally tougher than when they started, too, especially if they competed a few times. In contrast, what are the reliable effects of aikido on most students? Certainly they will have learned basic rolls and how to fall safely, though not necessarily from rough throws. They may be somewhat more fit. Beyond that it is unclear.